We offer a full range of catering services at the Hotel; breakfast, lunches, bar meals and a full dinner menu. We also cater for a broad spectrum of functions and events. Our menus utilise a vast range of local produce - beef from locally reared cattle, fish caught off the shores of western Scotland, dairy products direct from local farms - which are all freshly cooked by our highly trained chefs to create succulent dishes of both traditional food and modern cuisine. This, coupled with superlative service we hope will result in an experience you will reflect upon for a long time to come. In 2008, the hotel was granted membership of The Scotch Beef Club, an organisation at the forefront of the promotion of Scotch Beef, whose patron is HRH Proincess Anne. In the whole of the Northern Highlands there are only 37 hotels and restaurants who are members including ourselves and this underlines our commitment to bringing you the best quality food locally available and thereby supporting local farmers. Our normal breakfast service is daily between 7.30 - 9.00am and 8.30 - 9.30 am on Sunday. Breakfast is available outwith these times but must be arranged in advance and is subject to limitations. The Chef can provide an alternative to the full Scottish breakfast but guests are requested to pre-book their requirements. A lunch menu comprising snacks and bar meals is available from mid-day to late afternoon every day. This menu is served in the bar, lounge bar and the Restaurant. 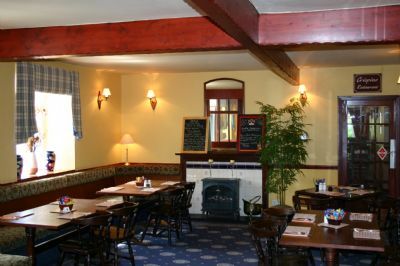 On Sundays you can also enjoy our special Sunday lunch menu which contains a variety of succulent roast lunches served in the traditional manner. Reservations are recommended as their reputation is growing fast. Our extensive dinner menu is served from 6 - 9 pm each day and is supplemented by our specials board. Meals can be arranged at other times in advance by contacting staff. Special dietary needs can be catered for with prior notification. Meals are served in the lounge bar and in Crispins Restaurant, for which reservations are recommended. Our wine list contains carefully selected quality wines from around the world. We serve traditional Scottish real ales (from the Cairngorm brewery) and lagers and we have an extensive range of highland malts from many Scottish distilleries for you to try. Remember - KIDS eat FREE at all times!! !